Background and objectives: The relationship between serum potassium (SK) and mortality in chronic kidney disease (CKD) has not been systematically investigated. Design, setting, participants, & measurements: We examined the predictors and mortality association of SK in the Renal Research Institute CKD Study cohort, wherein 820 patients with CKD were prospectively followed at four US centers for an average of 2.6 years. Predictors of SK were investigated using linear and repeated measures regression models. Associations between SK and mortality, the outcomes of ESRD, and cardiovascular events in time-dependent Cox models were examined. Results: The mean age was 60.5 years, 80% were white, 90% had hypertension, 36% had diabetes, the average estimated GFR was 25.4 ml/min per 1.73 m2, and mean baseline SK was 4.6 mmol/L. Higher SK was associated with male gender, lower estimated GFR and serum bicarbonate, absence of diuretic and calcium channel blocker use, diabetes, and use of angiotensin-converting enzyme inhibitors and/or statins. A U-shaped relationship between SK and mortality was observed, with mortality risk significantly greater at SK ≤4.0 mmol/L compared with 4.0 to 5.5 mmol/L. Risk for ESRD was elevated at SK ≤4 mmol/L in SK categorical models. Only the composite of cardiovascular events or death as an outcome was associated with higher SK (≥5.5). Conclusions: Although clinical practice usually emphasizes greater attention to elevated SK in the setting of CKD, our results suggest that patients who have CKD and low or even low-normal SK are at higher risk for dying than those with mild to moderate hyperkalemia. Hyperkalemia (serum potassium [SK] ≥5.5 mmol/L) is common in patients with ESRD. In the dialysis population, the prevalence of hyperkalemia has been estimated to range from 5 to 10% (1). Hyperkalemia is thought to contribute to 2 to 5% of deaths among patients with ESRD and accounts for up to 24% of emergency hemodialysis sessions in this population (2–4). Hyperkalemia has also been associated with increased mortality (up to 17%) in the general hospitalized population (5). Although nephron adaptation occurs in those with progressive renal insufficiency by way of enhanced distal tubular secretion of ingested potassium (6), mildly elevated potassium levels are not uncommon and dietary restriction of potassium is frequently considered prudent for patients with advanced chronic kidney disease (CKD) to avoid dangerous hyperkalemia (7). Adverse effects of SK ≤3.5 mmol/L have been well documented in the cardiovascular literature. Among patients with heart failure, hypokalemia is associated with ventricular arrhythmias and death (8); however, little is known about adverse effects of hypokalemia in the CKD population, which is known to be at high risk for cardiovascular disease in general and sudden death in particular (9). We postulated that lower (<3.5 mmol/L) levels of SK would be associated with higher risk for mortality in a CKD population. The aims of this study were to examine the distribution and predictors of SK and association, if any, of SK with mortality, ESRD, the composite outcome of death or ESRD, and the composite of death or any cardiovascular event in a CKD cohort. This prospective observational study of adult patients with stages 3 through 5 CKD was conducted at four outpatient nephrology clinics in the United States. Patients were recruited between June 2000 and February 2006. The inclusion criteria were age >18 years and a creatinine clearance of ≤50 ml/min by the Cockcroft-Gault formula, although subsequently estimated GFR (eGFR) values that were recalculated by the four-variable Modification of Diet in Renal Disease (MDRD) equation were occasionally >50 ml/min per 1.73 m2. A total of 834 patients enrolled in the study. Patients were followed by the study coordinators whenever they presented for routine clinical care to their nephrology clinics. The institutional review boards at all participating sites approved the study, and all patients provided written informed consent. Details of the study design have been published previously (10). At enrollment and follow-up visits, data on demographic, anthropometric, cause of CKD, comorbidities, laboratory variables, medications, and outcomes (ESRD, death, and cardiovascular events/procedures) were collected. Of 834 patients, 820 had SK values available at study entry and were included in the analyses. SK values that were obtained from baseline and subsequent clinic visits were classified into the following categories: ≤4.0, 4.0 to 5.5, and ≥5.5 mmol/L. Linear regression models were used to assess predictors of SK at baseline, with the adjusted R2 used to compare models in an all-subsets regression analysis. The distributions of SK values was illustrated using box plots by eGFR, gender, angiotensin-converting enzyme inhibitor (ACEI) use and quartiles of serum carbon dioxide (CO2), using all available SK values during follow-up time. The SAS mixed procedure (SAS Institute, Cary, NC) was used to test for differences in SK values between groups. To predict SK during follow-up time, we used mixed linear regression models with a spatial anisotropic exponential covariance structure (to account for correlation between follow-up visits of differing intervals). 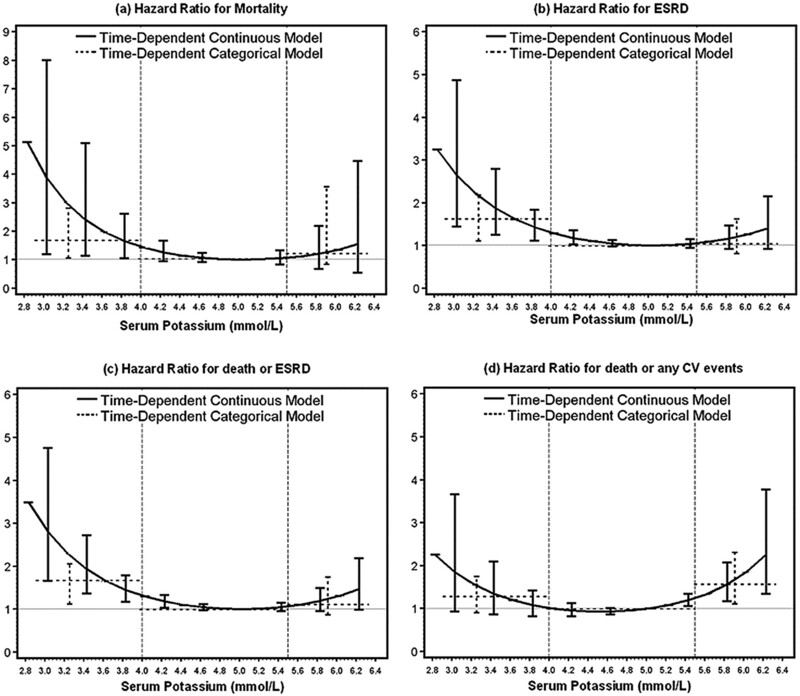 Separate Cox models evaluated the associations between SK (as a continuous or as a categorical covariate) and time to death, time to ESRD, the composite outcome of death or ESRD, the composite of death or any cardiovascular event (defined as prespecified coronary disease–, cerebrovascular disease–, or peripheral vascular disease–related events that required hospitalization or revascularization procedures in any of the named three major arterial beds). All models entered SK as either a baseline or a time-dependent variable that changed at each measurement during the follow-up period. In baseline models, SK was a weaker predictor than time-dependent SK, probably because measures of SK that are more proximate to the event have higher predictive power; therefore, only time-dependent models are presented. Cox models were adjusted for age, gender, race, and diabetes status; history of cardiovascular disease; hypertension; and eGFR. Variables that were considered but excluded as adjustments included diabetes and race, based on P > 0.2. Models were considered both with and without the inclusion of serum albumin. All analyses were conducted using SAS 9.2 (SAS Institute, Cary, NC). An average of six SK values per patient (n = 820) were available during the course of the study. The average duration of patient follow-up was 2.6 years (range 0.0 to 7.0 years), with three nephrology clinic visits per year, on average. The average number of visits for those with stage 3 CKD was 1.94 visits per year and for stage 4 CKD or more was 2.58 visits per year. Table 1 shows baseline characteristics of patients who were included in this analysis. Patients were predominantly white (80%) and had a mean ± SD age of 60.5 ± 15.4 years (range 18.0 to 93.0 years) and mean eGFR of 25.4 ± 6.9 ml/min per 1.73 m2 (range 3.7 to 91.7 ml/min per 1.73 m2). The majority had hypertension (90%), and 36% had diabetes. The average SK level was 4.6 ± 0.9 mmol/L (range 2.5 to 7.0 mmol/L). Figure 1 shows the distribution of SK by eGFR category. There were significant differences in the average SK values and CKD stage (P < 0.05 for all pairwise mean differences). Figure 2 displays the distribution of SK by gender, ACEI use, and quartiles of serum CO2. There were significant differences in the average SK values between men and women (P < 0.0001) and between ACEI users and nonusers (P < 0.0001). The significant trend in average SK by quartiles of serum CO2 (trend P = 0.05) shows lower average SK with higher serum CO2 relationship. Figure 2 also shows the wide variation in SK values at all levels of these strongly predictive covariates. 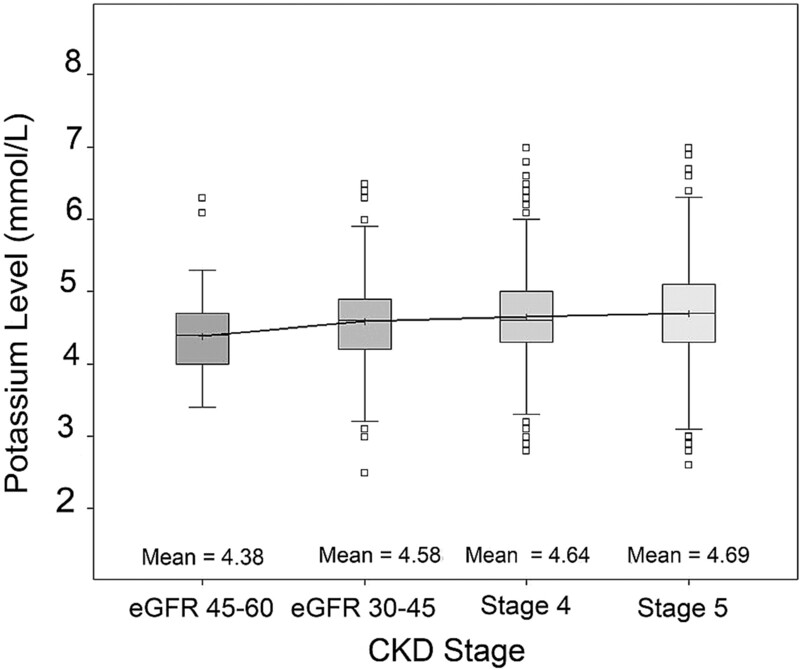 Box plot distributions of SK by eGFR categories (45 to 60, 30 to 45, 15 to 30, and <15). 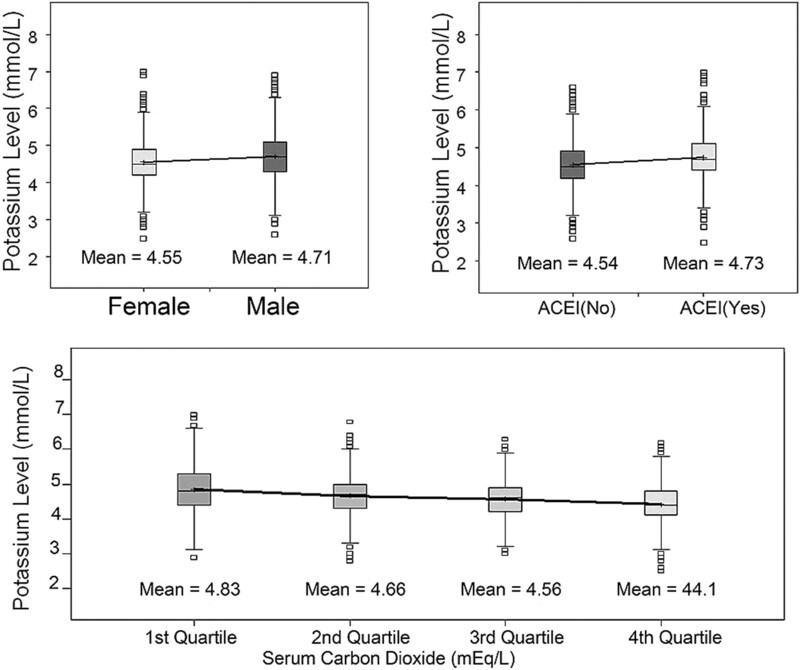 Box plot distributions of SK by gender, ACEI use, and quartiles of serum CO2. Table 2 shows a cross-sectional model predicting baseline SK and a longitudinal model predicting SK during the follow-up period. In the baseline model, higher SK was significantly associated with male gender, lower serum CO2, diabetes, and use of ACEIs and/or statins. In time-dependent models, higher SK was additionally associated with lower eGFR and absence of diuretic and/or calcium channel blocker use. The estimated correlation between repeated SK values from the same patient in the longitudinal model was approximately r = 0.53, indicating relatively stable SK levels for a given patient over time. Among the 820 patients, there were 86 deaths before reaching ESRD. Using the three categories of SK in a Cox model adjusted for age, gender, eGFR, hypertension, and history of cardiovascular disease, we found that pre-ESRD mortality was significantly higher for SK ≤4.0 mmol/L compared with SK >4.0 and <5.5 mmol/L, but higher SK (≥5.5 mmol/L) was not associated with elevated mortality (Table 3). Furthermore, when modeled as a continuous variable, a marginally significant quadratic effect was observed, with significant effects at lower SK (≤4.0 mmol/L) but not at higher SK (≥5.5 mmol/L; Table 3). Figure 3a displays the model-based U-shaped relationship between risk for mortality and SK. After addition of serum albumin to the model, low SK remained significantly associated with mortality (Table 3). Relationship of SK and risk for mortality (a), risk for ESRD (b), risk for the composite of death or ESRD (c), and risk for the composite of death or cardiovascular events that require hospitalization (d), using SK as a time-dependent continuous covariate (smooth curves). In addition, SK as a categorical time-dependent covariate is shown, with the middle category (SK >4.0 and <5.5) as the reference group in the Cox model; 95% confidence intervals are given for the continuous SK models at SK values of 3.0, 3.4, 3.8, 4.2, 4.6, 5.4, 5.8, and 6.2, with upper limits truncated at 8.0 in panel a. There were 303 ESRD events (n = 263 dialysis, n = 40 preemptive transplants). In the model with SK as a categorical model, low SK (≤4.0 mmol/L) but not higher SK (≥5.5 mmol/L) was significantly associated with elevated risk for ESRD (Table 3). When modeled as a continuous variable, a significant quadratic effect was observed. Figure 3b displays the U-shaped relationship between risk for ESRD and SK. After addition of serum albumin to the model, low SK was marginally associated with ESRD (Table 3). For the composite outcome of death or ESRD (Figure 3c), a U-shaped relationship between SK and the composite outcome was evident. There was a significantly higher hazard for death/ESRD at lower serum SK, the significance of which was attenuated by adjustment for serum albumin in the model. As a categorical variable, lower SK levels remained a significant predictor of the composite outcome before and after adjustment for serum albumin (Table 3). Higher SK was not significantly associated with the composite outcome. A total of 190 cardiovascular events (70 coronary, 50 cerebrovascular, and 70 peripheral vascular) that required hospitalization were documented during the course of the study. A significant quadratic relationship was seen between SK, and the relative hazard of first cardiovascular event or death (Figure 3d) was noted. Unlike overall mortality, this was statistically significant for SK >5.5 mmol/L but not for lower potassium (<4.0 mmol/L). After addition of serum albumin to the model, higher SK but not lower SK was associated with the composite outcome (Table 3). To the best of our knowledge, this is the first study to investigate systematically the prevalence and mortality associated with SK levels that are obtained during routine clinical practice in a large and diverse nondialysis prospective CKD cohort. Our main finding is that SK level ≤4.0 mmol/L was associated with a higher risk for mortality and ESRD compared with SK between 4.1 and 5.5 mmol/L. These observations are of clinical importance, because most physicians consider SK values of 3.5 to 3.9 mmol/L to be “within normal limits.” Our multivariable analyses show that the lowest risk for mortality was in the SK range of 4.1 to 5.5 mmol/L and that mortality or ESRD risk was not significantly higher even at SK levels of 5.5 to 5.9 mmol/L, a range of SK values that almost always evokes clinical concern with or without intervention (e.g., dietary advice, prescription of loop diuretic, discontinuation of potassium-sparing diuretics). This modest level of hyperkalemia seemed to be well tolerated in this patient population from the perspective of predicting mortality risk. The link between relatively normal or low-normal levels of SK (3.5 to 4.0 mmol/L) and mortality has not been previously documented in the CKD population. This finding is not altogether surprising, however. Low SK levels affect myocardial resting membrane potential, which increases the probability of ventricular arrhythmias and sudden cardiac death (11). Hypokalemia can also predispose patients to developing diastolic dysfunction, digoxin toxicity, and insulin resistance, all of which increase the risk for cardiovascular events and death (12–16). Dietary potassium depletion has been linked to the genesis of hypertension, and supplementation can improve BP control (17–19). Data from the cardiovascular literature suggest that serum potassium levels <4.0 mmol/L portend a worse prognosis among those who have a history of heart failure or acute myocardial infarction (20,21). Current American Heart Association/American College of Cardiology guidelines recommend that serum potassium levels be maintained between 4.0 and 5.0 mmol/L in those with chronic heart failure (22). Our study provides observational evidence that necessitates similar guidelines for patients with CKD. Not surprising, diuretic use was associated with lower SK levels in this study. Non–potassium-sparing diuretic use has been linked with increased mortality and hospitalization that can likely be attributed to low SK levels (23). Several case-control studies reported an increased risk for cardiac arrest among patients who received high dosages of thiazide diuretics. This risk was lowered when thiazide therapy was combined with potassium-sparing diuretics (24–26). Because diuretics are very commonly used for volume and BP control in the CKD population and hypokalemia is a frequent complication of this class of medications, these results suggest that clinicians need to monitor SK levels closely and consider using potassium-sparing diuretics and/or potassium supplements in patients who have CKD and are prone to hypokalemia; however, clinical trials will need to be performed before formulating definitive recommendations in this regard. We have no definitive explanation for why statin use should be associated with higher SK levels; however, we speculate that statin use by virtue of its potential to cause subclinical muscle injury could be associated with release of SK from cells, accounting for the higher SK. Creatine phosphokinase levels, which would have allowed the testing of this hypothesis, were not measured in this CKD cohort; therefore, this potential mechanism cannot be commented on. The association of higher SK with lower eGFR is not surprising. As renal function declines, potassium balance is usually maintained via increases in potassium excretion per functioning nephron (6). Hyperkalemia stimulates aldosterone secretion, which also increases the fractional potassium excretion (27). Patients who have CKD and have been given a potassium load actually maintain their SK levels when compared with control subjects, strongly supporting the presence of compensatory extrarenal mechanisms of potassium loss (28). Patients with CKD also have been found to have increased extrarenal potassium excretion through both increased intestinal potassium excretion and increased potassium translocation into the intracellular component (29,30). It has been postulated that those with diabetes are more likely to have relative aldosterone insensitivity and therefore are predisposed to the development of acidosis and hyperkalemia (31). In addition, inadequate insulin secretion may lead to extracellular potassium shifts (32). We speculate that given that this cohort of patients was being followed in nephrology clinics, concomitant diuretic use or nutritional advice to lower potassium intake may have potentially attenuated the relationship between eGFR and SK, as well as that of diabetes status and higher potassium levels, particularly among those with stages 4 to 5 CKD. In our study, higher SK was associated with use of renin-angiotensin-aldosterone system antagonists such as ACEIs. Hyperkalemia is a widely recognized adverse effect of the use of such agents. The risk for development of elevated potassium levels is low (<6%) in those with normal renal function but higher among those with CKD (5 to 50%) (33). In this study, a modest degree of hyperkalemia (SK between 5.0 and 6.0 mmol/L) seemed to be well tolerated with no significantly elevated risk for mortality. In contrast, the association between higher SK and the risk for cardiovascular events (or the composite of cardiovascular event or death) is somewhat surprising, given our findings with respect to the outcome of mortality or ESRD as the outcomes of interest; however, we speculate that this may be due to the greater documentation of cardiovascular events (related to hospitalization) among survivors in this cohort, who on average have a higher potassium level (i.e., it is more likely related to a “survivor bias” than a true “causal” link, although the latter cannot be excluded on the basis of this study alone). The association between increased risk for ESRD and hypo- and hyperkalemia has not been previously documented in the literature. In one study (34) patients with hypokalemia were less likely to be taking ACEIs, which has been shown to slow progression of CKD. In two other studies (35,36), patients with hyperkalemia were more likely to have higher phosphorous levels, lower eGFR, and lower bicarbonate levels, factors that all have been independently linked to progression of CKD. The strengths of our study include a large prospective cohort of CKD with availability of serum potassium in the majority of patients at multiple time points during follow-up, permitting analyses with SK as a time-dependent covariate. The long duration of follow-up (median 3 years) and detailed medication data are additional strengths. Certain limitations merit consideration. Data on the dietary intake of potassium and protein was not collected in the Renal Research Institute CKD Study; however, we examined models with and without adjustment for serum albumin, a major marker of nutritional status. The predictive value of SK was slightly attenuated by this adjustment, suggesting that nutritional state may be part of the explanation for the link between low SK and mortality. In this study, death, ESRD, and cardiovascular event information was abstracted by study coordinators primarily from patient charts. It is possible that some events were not detected. The average time from the last SK measure until death was 8.2 months, and the median was 5.8 months; therefore, we do not have values of SK closer to the time of death. The relatively weak association of higher SK with mortality may be the result of dialysis initiation as “rescue” therapy in the face of emergent hyperkalemia and absence of data pertaining to serum potassium just proximate to dialysis initiation among those who reached ESRD. Similarly, the association between higher levels of SK and cardiovascular events may reflect a survivor bias rather than a causal effect, although the latter cannot be excluded. Despite these limitations, the association, particularly at the lower end of the range of potassium levels in this patient population, could more plausibly be causally linked (based on what is known about the adverse effects of low potassium) to adverse outcomes in this and other patient populations. Causal inferences cannot be drawn with certainty, however, in the setting of an observational study such as ours. Lower SK (even less than or equal to a “normal” level of 4.0 mmol/L) seems to predict mortality to a relatively greater degree compared with the risk associated with SK ≥5.5 mmol/L. This study shows that the levels of SK that are associated with lowest risk for mortality are between 4.1 and 5.5 mmol/L, which suggests that maintaining SK in this range may potentially help optimize survival in patients with CKD. Practice patterns could potentially be adapted to supplement potassium (through dietary modification or pills) and avoid use of loop diuretics whenever possible. The benefits of potassium-sparing diuretics such as aldosterone receptor–blocking agents may be due in part to their ability to “normalize” serum potassium levels. Aldosterone is increasingly recognized to be important in the pathogenesis of CKD (37,38), and mineralocorticoid receptor blockade is an increasing used strategy in lowering proteinuria with the potential of both slowing renal disease progression and lowering mortality. These issues warrant future studies that specifically address the role of potassium supplementation in determining outcomes and study the deliberate optimization of serum potassium levels by use of specific drugs in randomized trials. Overall, our findings suggest that attention should be paid to patients who have CKD and are at the lower ranges of SK as well as those with elevated serum potassium to prevent adverse outcomes such as mortality, ESRD, and cardiovascular events. This study was funded by the Renal Research Institute (New York, NY) and Amgen. R.S. is Principal Investigator and B.W.G. is a Co-Investigator in the Centers for Disease Control and Prevention's National Chronic Kidney Disease Surveillance Project (MM-1149-0/10). Report contents are solely the responsibility of the authors and do not necessarily represent the official views of the Centers for Disease Control and Prevention. The results from this analysis were presented in part as a poster (TH-PO918) at the annual meeting of the American Society Nephrology; Philadelphia, PA; November 2 through 4, 2008. We are grateful to all study coordinators and participating patients at the following study sites: University of Michigan (Ann Arbor, MI), Albany Medical Center (Albany, NY), Metabolism Associates (New Haven, CT), and University of North Carolina, Chapel Hill (Chapel Hill, NC).